On Tuesday, March 7, West Hollywood voters will head to the polls to decide who will represent them on two of the City Council’s five seats. The seats are at-large, meaning each council member represents the entire city. The West Hollywood Bicycle Coalition crafted a six-question questionnaire and sent it to all ten candidates. Their completed questionnaires are linked to below, in alphabetical order. As a chapter of a 501(c)(3) non-profit organization, the Los Angeles County Bicycle Coalition, we cannot endorse candidates, but we hope you find this information helpful as you educate yourselves about candidates. For a sample ballot & precinct map, please visit the City’s Election Information Web page. 1. Have you been involved in any efforts to promote cycling or improve safety for bicyclists? If so, please explain. Yes. I am a cyclist. I have participated in 3 AIDS Life Cycle rides from San Francisco to Los Angeles to raise money to fight HIV/AIDS. So, I have pedaled for thousands of miles – literally! The most frightening aspect of being on a bicycle was close encounters with car doors or vehicles who couldn’t see me. This is why I supported the creation of bike lanes along Santa Monica Blvd and other streets in West Hollywood. On those sections of Santa Monica Blvd which are too narrow, I made sure that pedaling on the sidewalks became a permissible option for riders to avoid collisions with vehicles or parked cars. I have also been a strong proponent and advocate for the creation of the bike share program here in West Hollywood. I served on the city council sub committee to strategize on the ideal programs and linkages to neighboring cities to make sure the bike share program would work. 2. Currently, West Hollywood has no east/west bike lanes going east of Kings Road. Would you support adding bike lanes on Fountain Ave. and/or Santa Monica Blvd. to create more efficient, safer east/west bike routes? Unfortunately, there are sections of Santa Monica Blvd which are quite narrow between Kings Road and Fairfax. There is only enough room for 2 lanes of traffic and parking and not enough room for a bike lane. We cannot eliminate a lane of traffic or parking in those areas. So, the road must be shared by vehicles and bikes or in the alternative, bikes are allowed to use the sidewalks without being cited. The same conditions exist on much of Fountain. It is a narrow road heavily utilized by commuters when Santa Monica Blvd and Sunset Blvd are jammed. So, it is not possible to eliminate a lane of traffic (although we do eliminate parking during peak hours). On these narrow sections of Fountain, the road must be shared by vehicles and bicycles. 3. The city and county of Los Angeles and dozens of cities and countries have embraced Vision Zero, with the goal of ending traffic fatalities. If elected, what would you do to reduce serious and fatal traffic collisions between vehicles and pedestrians/cyclists in West Hollywood? As a councilmember, I recently approved 5 new signalized crosswalks on Santa Monica Blvd between La Cienega and Robertson. These new signalized crosswalks will reduce the number of vehicle collisions between automobiles and pedestrians/cyclists. We have also introduced numerous traffic calming devices on residential streets to stop speeding in residential areas to reduce these accidents. These include bulb outs, turn abouts, new islands in lanes and other deterrents to force vehicles to slow down. 4. Last summer WeHoPedals launched, bringing bike-share to our city! While the firm CycleHop operates bike share systems for West Hollywood, Beverly Hill, Santa Monica, and Long Beach, the systems are not interconnected – memberships are separate and in many cases the bikes cannot be dropped off in other cities without incurring additional fees. How would you move towards regional connectivity so that riders can use bike-share in our entire region with a single membership? We do need greater cooperation between the 88 cities in LA County to created a unified system. However, we could not agree to go with the same system as the City of Los Angeles because their system was inferior and not capable of serving our community needs. Bike share is a new phenomenon for all of Southern California. It will take a period of experimentation for the various cities to try systems, evaluate, adapt and eventually merge. The benefit of competing systems during this period of time means that we can evaluate different options and see what works best before we have a county wide system. 5. 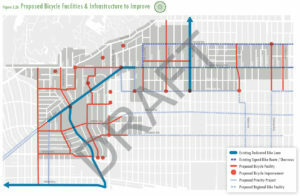 Would you support increasing the visibility of the existing bike lanes on Santa Monica Blvd. by treating them with green paint? 6. What else would you like to see West Hollywood do to promote bicycling and improve safety for people who ride bikes? We must continue doing cyclist safety education as well. Bike helmets must be worn. Rules of the road must be followed. During traffic jams, cyclists should also slow down and carefully monitor traffic patterns. Accidents are sometimes caused by reckless cyclists. So a continuing campaign for cyclist safety must also educate the public for the protection of riders, pedestrians and drivers. I am a cyclist and a 2015 rider in the AIDSLifeCycle. At the recent WHCC/LWV Candidate Forum, I spoke of West Hollywood’s need for greater bicycle lane visibility. Bicycle and pedestrian safety are key issues in my campaign. I support adding bike lanes to all major corridors, and on SMB in particular. I support signals at all crosswalks, scramble crosswalks at major intersections, brightly colored bike lanes, and repairing roads that are unsafe for cyclists. I am unaware of any City impediments to CycleHop providing interconnected memberships. If elected, I would (of course) support any efforts to connect WehoPedals to BH Bike Share, SM Breeze, etc. I believe WeHo needs to incentivize businesses to encourage employees to find alternate means of transportation to work, and biking should be a part of that conversation. For instance, we should explore the possibility of credits or subsidies for businesses whose employees bike, carpool, or utilize public transportation to get to work. I also support the City’s recent effort to distribute bicycle tail lights, and I hope to see similar programs – promoted better – in the future. I had said at the candidate forum and in the recent Wehoville Election guide that the bike lanes should be wider and painted, to make it more safe for cyclists. Absolutely. I’d loved to see bike lanes designated all over this city and L.A. County, that are designed to keep the cyclists safe from distracted drivers and encourage cycling as an alternative transit. Good for the pollution reduction, the environment, body and mind. Again, designated curbed bike lane/path, like in Copenhagen, that are only for cyclists, separating them from cars. It has to be a collaborative effort, working in concert with adjacent cities, that continue to connect to other adjacent cities, putting the program under one easy monthly payment plan. Give incentives or gift certificates from local businesses to residents who use their cars significantly less and WeHo Bike more, showing a great reduction in monthly car mileage. Short commute are one of the reasons for traffic congestion. I supported the effort to include bike lanes on Santa Monica when we reconstructed Santa Monica Blvd. I supported the effort to install “sharrows” in parts of the City and to install bike lanes on Fairfax and San Vicente. I also led the effort to bring a bike share program to West Hollywood. Installing bike lanes on Fountain or Santa Monica east of Kings Road would likely require us to lose parking or a lane of traffic. I don’t think it can be done in a way that ensures safety for cyclists. I’d rather look at ways we could make streets like Romaine or Willoughby more bike oriented. I support efforts to end fatalities. We have been working on a multi-year project to improve crosswalk safety by signalizing high volume crosswalks. We also need to do more to reduce alcohol-related accidents. Some of the accidents we have in the evening involve impaired drivers. The benefit of a program like Vision Zero is that it is data driven and it starts with the assumption that we can do more to prevent accidents and reduce the likelihood that accidents will result in fatalities. The goal from the beginning has been to make the programs interconnected. Our staff has been meeting with CycleHop and representatives of the other cities to allow members to pick up and drop off in all of the cities without additional charges. My goal is that a person could pick up a bike in West Hollywood and ride it to Beverly Hills or Santa Monica or pick up in Santa Monica and ride back to West Hollywood. I support increasing the visibility of the bike lanes. This could be accomplished by painting them or treating them in some other fashion. We are currently working to add bike racks on our shuttles, especially our shuttles to the metro stops. We also need to do more to educate motorists about the importance of paying attention to cyclists and adhering to state laws regarding safe driving near cyclists. While we promote West Hollywood as a “bike friendly” City and think we all want to insure that we close the gap between our good intentions and the challenges cyclists face within our City. When I was on City Council I worked with the LA Bike Coalition on our Santa Monica Blvd. Re-Design to create admittedly limited bike lanes. I also worked with the Coalition on bike safety issues and on “Bike to Work Day” promotion. I ride my bike recreationally on weekends down Santa Monica Blvd. so I am very familiar with the lack of bike lanes and the issues arising out of that lack. Ultimately Santa Monica Blvd. will need to have bike lanes and we should have taken advantage of the new construction of the Eastside to lay the foundation; unfortunately that was a lost opportunity. When we take over the block at Santa Monica and Crescent Heights, we can at least create a bike lane on the south side of the street for that block. Perhaps we should look at “rush hour” bike lanes by banning parking during peak driving times along Santa Monica and Fountain; I am open to creative suggestions. While West Hollywood faces a parking deficit, on Santa Monica east of King’s Road, any place we can remove a parking space creates an opportunity for bike safety as the boulevard is so narrow. I was hit while stopped for a red light at Melrose and Robertson so I have personal experience with bike/auto conflicts. We need ongoing education about sharing the road and we should think about creative ways to enhance safety for cyclists, including signage regarding right turns, which seem to have a high number of incidents. I would look into figuring is there are ways to provide helmets for a bike share program. I support ideas like providing free helmets to school children to promote awareness. The Bike Share program is balkanized and we need to work with other jurisdictions to merge the programs. A regional approach should have been taken from the beginning but we should at least be moving toward rectifying the situation. Bike lanes should be high lighted: green or orange paint, whatever gets attention and is in use in our neighboring cities. Ideally bike showers at Plummer Park and continue to push for locker rooms and showers for employees that bike; including City Hall employees. I absolutely support more bike lanes to create safer east/west bike routes. I believe that would be a great start to creating bike mobility for our City. Bike safety is a very important issue. Revisiting the Pedestrian Bike Mobility Plan would be a great kickstart to expand safer bicycle routes. The infrastructure could be improved to increase both ride-ability and visibility for cyclists. West Hollywood needs more distinct bike paths just the same way the crosswalks on Santa Monica are distinct. Proper signs and bolder bike lane outlines are essential in moving forward. It is important to work with other city officials in promoting safety and accessibility for West Hollywood. If elected, I would work with the different organizations towards making a bike share program a regional connectivity. I do not believe that our cities borders should be closed when it comes to bike mobility and public safety. I am for increasing the visibility of bike lanes on Santa Monica Blvd with green paint. White lanes make them blend in with our road paint and it causes a serious issue with drivers distinguishing bike lanes from the road lanes. I would like to see West Hollywood campaign harder for awareness of cyclists on the roads. This would engage the public and encourage drivers to look out for those on bikes.